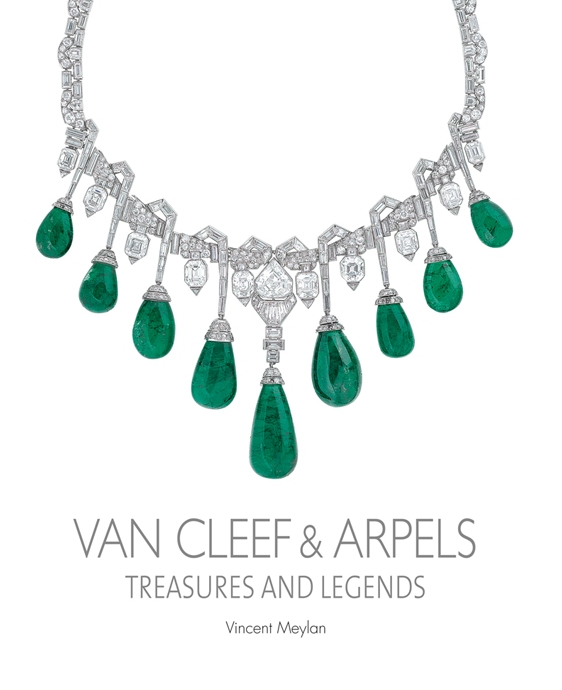 When I opened up my Christmas presents this December, one of the heaviest and most intriguing packages revealed a bejeweled surprise: a copy of Vincent Meylan's Van Cleef & Arpels: Treasures and Legends. I've been slowly working my way through the book, and I'm happy to say that it hasn't disappointed. Meylan has used his access to the VC&A archives to produce a large volume full of high-quality photographs and fascinating anecdotes. The book is extremely substantial, weighing more than five pounds, and is among the largest of my books on royal jewels. At more than 300 pages, this is definitely a coffee-table book. And it's definitely attractive enough to display in your living room. The production value of the text is high, with a clean, striking cover design and glossy pages. The content of the book is divided in eight sections. Four of these are focused exclusively on royal jewelry, with in-depth explorations of the VC&A jewels owned by the Maharini of Baroda, the Duchess of Windsor, the Princess of Rethy, and the former imperial family of Iran. I especially love that the book delves into the collections of royals from Asia and the Middle East rather than focusing solely on jewels worn by European royals. The pages on the Iranian jewels are especially fascinating, as the company played an interesting role in bedecking the last empress, Farah Pahlavi. The book also covers jewels worn by socialites and Hollywood stars. There are pages dedicated to Elizabeth Taylor, Barbara Hutton, and Marlene Dietrich, among others. One chapter is inspired by Balanchine's Jewels, surveying diamonds, rubies, and emeralds created by VC&A; this section includes jewels worn by Empress Eugenie, the Romanov women, and Princess Grace. Meylan even reproduces a 1950 catalogue of historic jewels published by the company. If I had to find something to critique about the book, it might be its organizational strategy. The chapter divisions don't always seem logical; at points I wished that Meylan had chosen to group the jewels by nation, or by time period, or by royal family, as there are points when the content seems scattered across numerous chapters. I think the text might also have benefitted from a bit more continuity, as the book ultimately presents a collection of stories rather than a strong narrative about the influence of Van Cleef & Arpels. But those are fairly minor quibbles, I think. The book is fun to dip into a bit at a time, enjoying individual stories and photographs. I've very much enjoyed reading the book, and I'm extremely happy that it's a part of my collection. The photographs alone -- which include images of the jewels and, intriguingly, images of sketches and designs that were not actually produced -- are worth seeing. I can't comment on the cost of my book, as I received it as a gift from a family member (who very cleverly snooped around this site before purchasing!). But Amazon currently has both new and used copies for sale; they're selling a new copy for $70, which is advertised as being $25 off the suggested retail price, while used copies are available for about $20 less. (As always, in the interest of disclosure: the Amazon links in this post are affiliate links, which means that I earn a small commission fee if you use them to purchase products.) More used copies of the text will surely be available at various outlets over the next few years. I think the first edition of this book was only published three years ago, so it's difficult to find extremely inexpensive used copies at this point. But, for what it's worth, I do think the quality of the book is consistent with other volumes in my collection that have retailed for around the $75 mark. So, should you buy it? If you're looking for a book that only surveys royal jewelry, perhaps not. If you're looking for a readable history of VC&A, maybe not. But if you're a fan of the company's designs, or if you're fascinated especially by the jewelry worn by the Pahlavi family, this book would be right up your alley. If you've already got this one if your collection, I'd love to hear your thoughts in the comments!